Creating a seasonal vignettes is my favorite way to decorate the kitchen table! 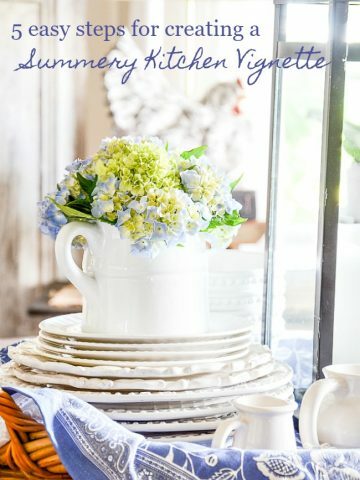 It’s so much fun to play with my dishes and fun elements to make a vignette that brings the outdoor season inside! You can see all the talented bloggers who are participating at the end of this post. This vignette started with a big round basket that I use for most vignettes in my kitchen and a beautiful rabbit towel laid in the bottom of it. 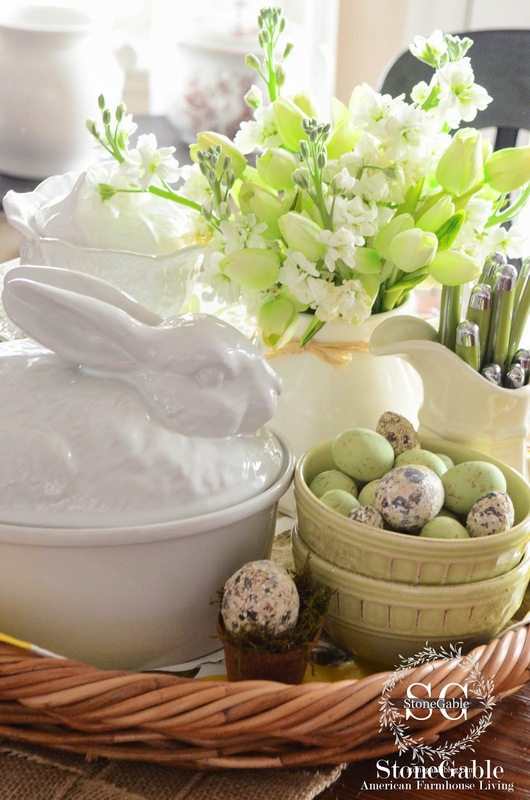 Because I am creating this Spring vignette to celebrate Easter, a white bunny covered dish had to be a part of it! Stock and tulips fill a small white pitcher. It gives much needed height to the vignette and smells divine!!!! I’ll let you in on a little secret… the stock is real, but the tulips are not! Did you notice that I tied a little bit of raffia around the neck of the pitcher? Another pitcher stands next to the flowers and is filled with green flatware. We use it at dinner, wash it and put it back in the pitcher. Easy and fun to change things up a bit! 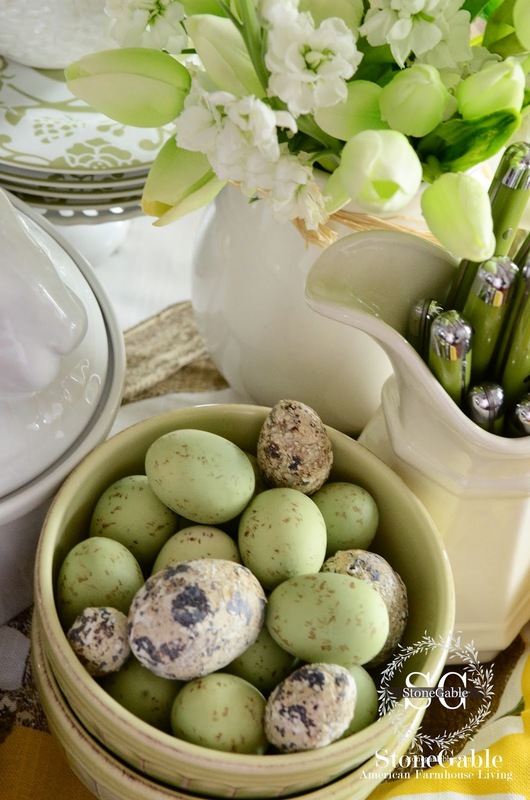 The inspiration for this vignette were these marvelous faux eggs. 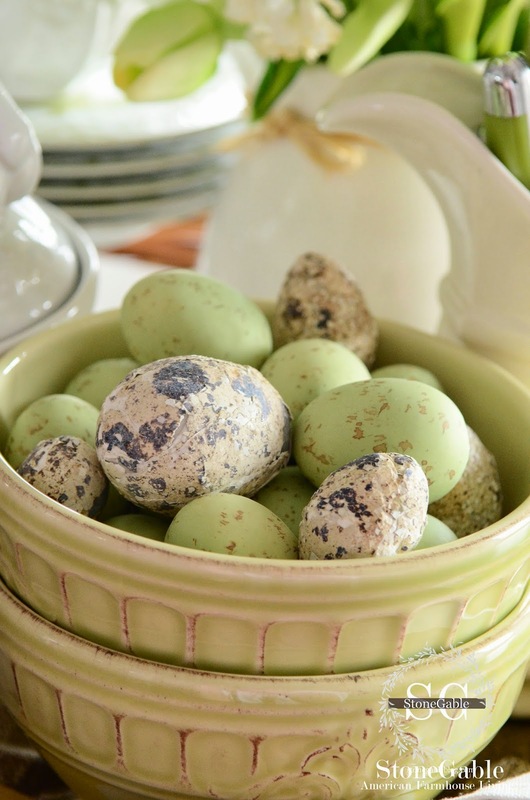 I love the combination of the green and the unusual mottled eggs. The eggs nest in a duo of green bowls. These bowls have a nice design and texture to them. At the back of the vignette is a small white pedestal with green bird plates on it. It’s all topped off with a delicate cabbage covered bowl. I think it is sitting a little to close to this hungry bunny! 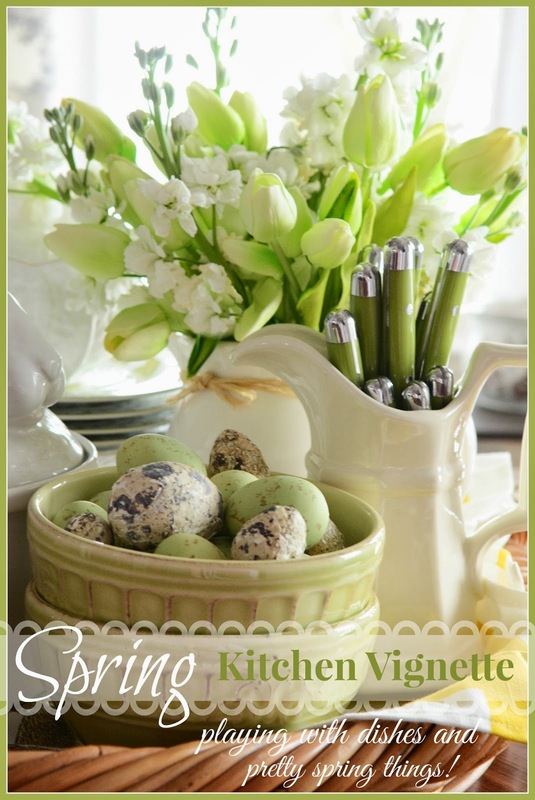 My kitchen is ready for Easter… with the help of an easy to put together vignette! Remember to pin this to your SPRING or TABLESCAPE Pinterst board. You an follow me on Pinterest and see all the great things I am finding HERE. Love this vignette! 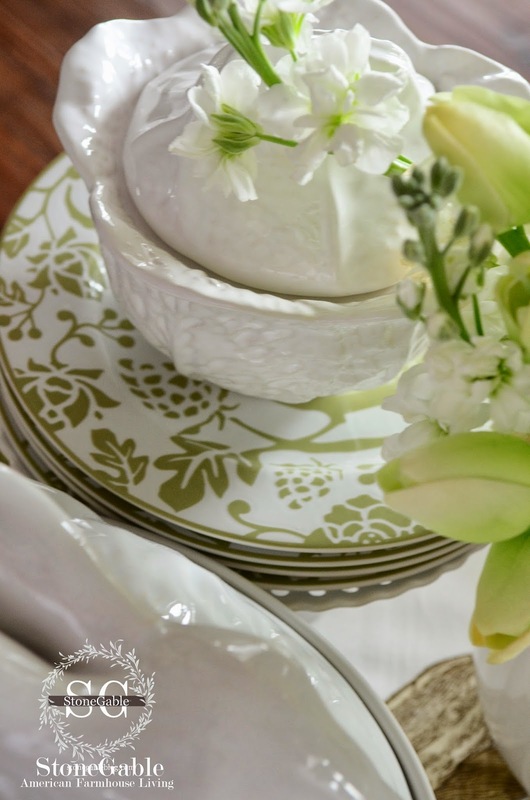 The mix & match of of muted greens, whites & browns make for a lovely palate. 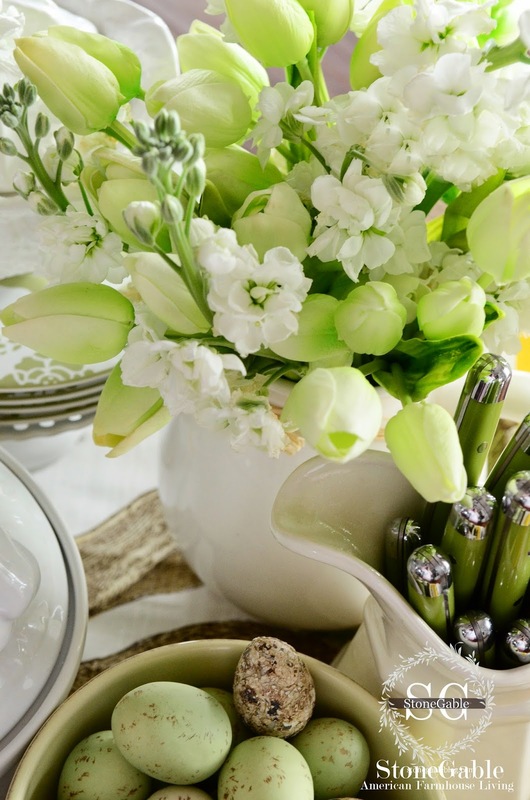 Love the green and white,so fresh and light for spring.I have those same green bird dishes and love them.The tulips are so pretty, one of my favorites. Yvonne, you are definitely one of my favorite bloggers and so look forwarding to receiving your emails!! I have incorporated several of these vignettes about the house and love the look!! THANK YOU and never too early to wish you/family a HAPPY EASTER!! You are so welcome! 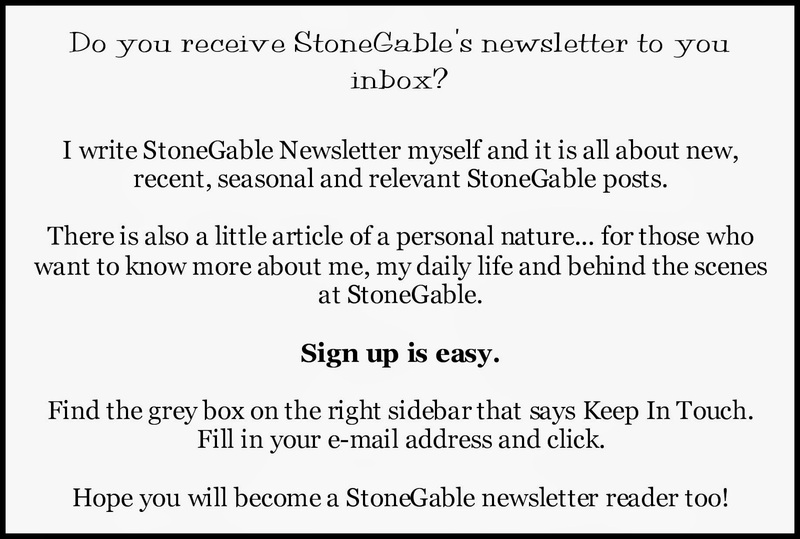 I’m happy to hear you are using what you see and learn at StoneGable. Love this kitchen vignette so much I plan to try to copy it. I have the bunny tureen and the green bird dishes plus some silverware with yellow floral print handles. I have put some white faux ceiling file on the base of a large tray and will shop my cupboards for some white pitchers. Yellow tulips or white?_ Will try a combo maybe. Can’t wait to put it all together and put it on my table in the kitchen! Thanks Yvonne and a beautiful Easter with your family. Ahhhh…I just love it all. Something about your style that is just so peaceful & cozy. Wondering if you have a maker of your green flatware & bowls? I just love it all! I have learned so much about vignettes from you. I attempted my first one yesterday, but went for Valentine’s Day and will re-do to create a Spring vignette. I love the way it turned out, thanks so much to your tips and know-how. I would insert a photo if I knew how. Yvonne, Stone Gable is my favorite decorating site! Thanks for sharing your talent 🙂 I have looked everywhere for a basket like the one used in many of your tablescapes. I haven’t been fortunate to find one yet. Suggestions? Such a lovely understated spring vignette! Inspires me! Love the mix of flowers, next the bunny tureen. Do you remember where the bunny came from? You pages are so inspiring! Thanks, Sheila. 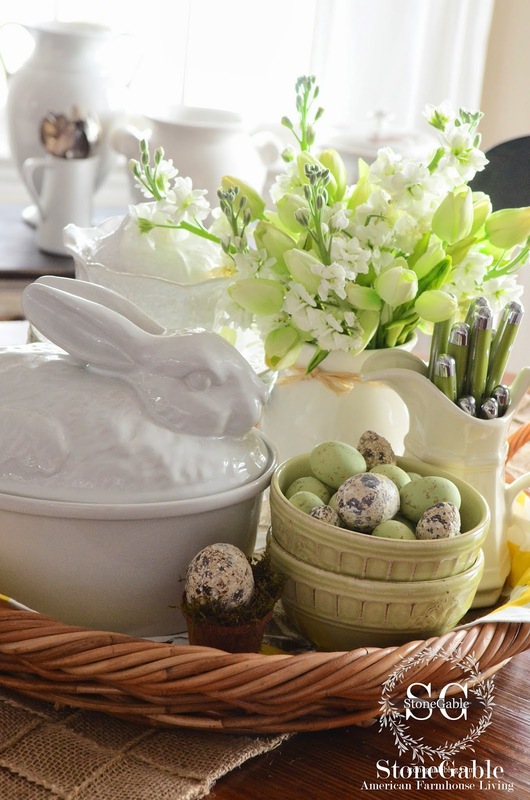 The bunny tureen came from Williams and Sonoma. Love the kitchen table arrangement! I’ve been looking for something different for mine and might have to copy! Thank you! I love this! Those greens are gorgeous and been adding some to my decor! You have a way like no other! Keep up the decorating! You are definitely my favorite! As always, Yvonne, your vignettes are SO beautiful. I love buying different small plates to change it up a bit on top of my white dinner plates. Can you help me with this …. what do you do when say, unexpected company comes in and stay for dinner and the plates, etc in the vignette won’t work with what you are going to eventually serve? Example: if you have the pretty vignette with lunch sized plates in the vignette and you decide to serve lasagna on dinner plates that are in your usual cupboard … what do you DO with your pretty vignette? Do you just try to remove the too-small plates but leave the tureen, flowers, etc. or what? I always wonder about this. Love this perfect vinyette. The colors & photography are so good. What camera do you use? I have often used split peas in the bottom of a vase to get this color effect. Love the green table setting!! Did I mention I Love it. Can I ask where you find realistic tulips? The ones I find never look this good unless they cost a small fortune. Tulips never look great most other silk flowers are very realistic. Please keep it coming. I love all seasons of table scapes. They make the room. When I buy silks I consider them an investment. I usually get them at small decor shops on sale. Hope this helps! Where do you get all of your colored flatware? And do you buy at least 8 for a place setting or just enough to use for your vignettes? Love your vignettes and the green is one of my favorites. I get it where ever I can find it Laurin. Most of the time HomeGoods has colored flatware. I like to get 8 or more if I can. But 4 will work if I mix and match it with another color. Hope this helps!!! Yvonne, so very beautiful! Where do you find your colored flatware? I am totally green with envy over your ceramic cabbage and bunny dish! Beautiful vignette! You always manage to create such lovely vignettes Yvonne! That little bunny from W&S is darling. I’m also loving the basket and flatware .. and I really do need to get over to HomeGoods! So pretty, Yvonne, as always! Love the little touches and the breath of spring it brings! Thanks for joining us! 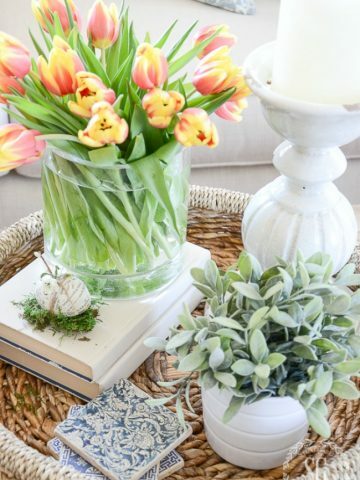 Love your spring table vignette. I would never know the tulips weren’t real! Love it! Also where did you get those eggs? So beautiful! I’m in love, Yvonne! 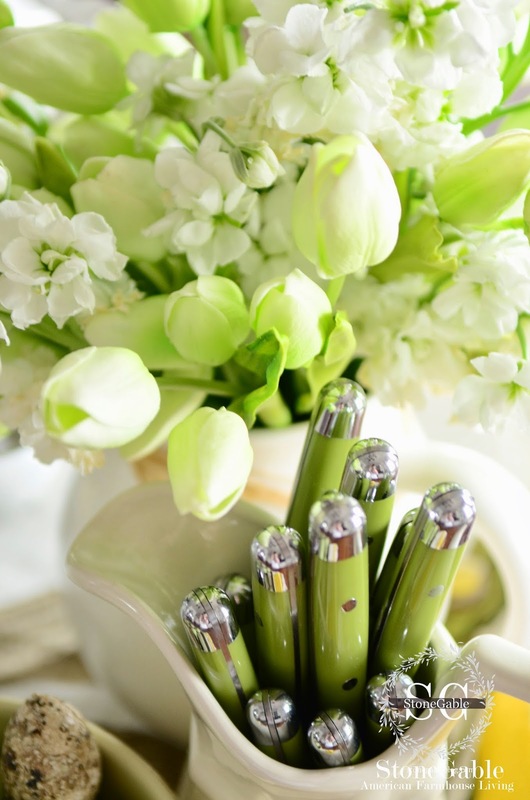 That green flatware is so gorgeous — and so spring. And I love the eggs, too. Such beautiful colors and texture. I love everything about your kitchen vignette. 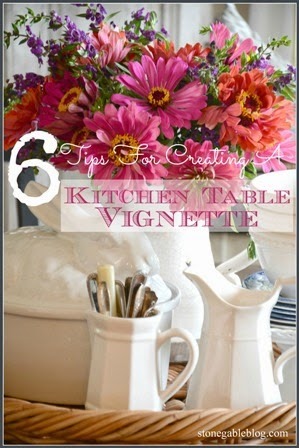 You are the Queen of Kitchen Vignettes! I declare it! The floewrs are so pretty, and of course I love the bunny tureen. Well done!!! So fresh for spring! I’ve been studying your blog so much since coming across it again recently. Just gorgeous as always Yvonne!!! Love your spring vignette! The greens and white are always perfect together and you always have the perfect accessories to pull off a stunning look. Yvonne, like Suzy I would love to know where you found the eggs. I have some from a shop in Bethlehem, Pa that has since gone out of business like so many small specialty shops. Haven’t seen any since. As usual, this vignette is simply beautiful. I can’t imagine where you get so much inspiration…you’re like the energizer bunny! Your vignettes are always so pretty and inspiring dear Ivonne. 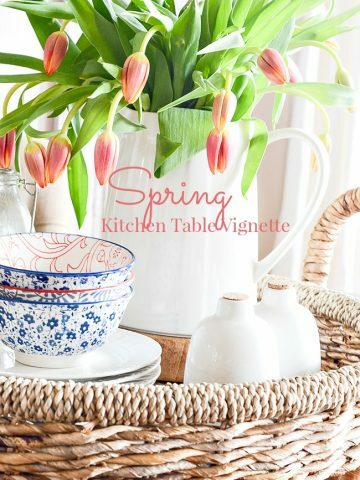 Here I’m posting for the Thursday vignette party my ‘Kitchen Spring Vignette.’ Thank you so much for this great party and for sharing such lovely creations of yours, such as this one! Yvonne, you always, always design the most beautiful vignettes and tablescapes. I especially love the wonderful low, round basket you’re using in today’s vignette. Do you mind sharing any info on it? Thank you so much and I hope you’re feeling better!! The basket came from HomeGoods (like so much in my home!). Beautiful as always Yvonne! I’m all linked up with my Spring Vignette, it’s been fun co-hosting the Swing Into Spring Party with you! Love them all…you knock it out of the park every time Yvonne!…You are such a source of wonderful inspiration on every level!! The covered bunny dish came from Wms-Sonoma. Simply gorgeous as always, Yvonne. I’m totally smitten with green these days and just love the delicate shade of green in your vignette. Please spill the beans and let us know where you found the eggs! I’ve never seen any green or mottled ones like that before. Hard to believe that the tulips aren’t real – they sure do look like they are. Thank you so much for co-hosting the Swing Into Spring vignette party with Mary and I today. Happy first day of spring! No the eggs are not candy, but wouldn’t that be fun! Love this so much. The colors match my kitchen and dining room accent colors. Oh my goodness I need that silverware giggle. You are so talented my friend, I hope you will share this lovely post at the hop today. Hugs! Love, love, love your center piece. Your green plates are very special. Just gorgeous…you are such a master at tablescapes…ever considered a book? I love the colors, like a breath of fresh spring air! Yvonne, That is my favorite shade of green! I love the combination of the stock with your faux tulips, I would have never guessed. 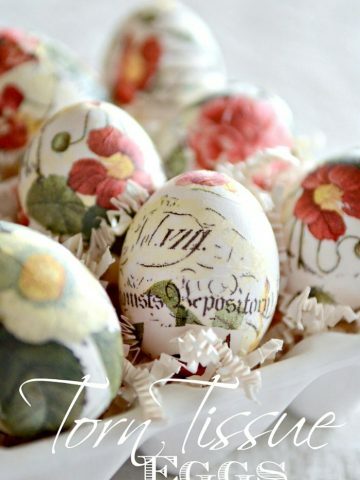 Beautiful eggs, your kitchen table says Spring!